Olympians are known for their superhuman powers - but which athletes give glory to God for their success? Several Christian athletes give God all the glory (Reuters). LOS ANGELES, CA (Catholic Online) - Several athletes have proudly proclaimed their faith and acknowledge their success was only made possible by the almighty Creator. Serbian tennis player Novak Đoković is the world's No. 1 tennis player in singles and is a member of the Serbian Orthodox Christian Church. Several interviews revealed he describes himself as a "person of faith" and offers the Lord a prayer and thanks prior to each meal. Laurie Hernandez is a 16-year-old gymnast for the United States. She has suffered several injuries including a dislocated kneecap, fractured elbows and wrists, a patellar tendon tear and even a took injury that left her unable to eat solid food for nearly a month. She explained the physical setbacks were difficult but are "all worth it" to be part of the 2016 Olympics. What really helps her keep calm and step away from fear of another injury is her faith in God and prayers she offers him regularly. According to Christian Post, Hernandez explained: "Usually, before I salute the judge I'm able to just grab the event and I pray on it and that really grounds me. For some reason, once I do that, I am able to think clearly and I'm able to calm down right before I compete." Her mother, Wanda Hernandez, also ensures her daughter maintains a good relationship with Christ. "She'll send me Bible verses in the morning - she always does - she's always reminding me not to forget to pray: 'I hope you remember to pray before you start anything. If you don't start your day off with God, then why are you doing anything today?" the younger Hernandez shared. Osea Kolinisau is a 30-year-old Rugby player from Fiji. He is the Fiji Sevens' team captain and claims God is the reason he is so strong. "First of all, I thank the Lord, he has been our source of strength," Kolinisau told SUNsports. "Our faith in God is really, really strong and we know he's our source of strength[.] Without Him on our side we couldn't have done what we did against New Zealand. "...Before we came in we told each other 'let's be strong, if you are weak then I'm going to help you. If I'm weak you help me' and we play for our country, for our family, and especially for the Lord we serve." Kolinisau explained: "I'm just thankful to God, the Bible verse that comes into my mind is 'No eyes have seen, no ears have heard what God has prepared for those who love Him.'" Anna Van Der Breggen, a 26-year-old Netherlands cyclist, explained: "On the bike you're quite vulnerable. That proved last year when I broke my pelvis during the World Cup. "Something like that can have major consequences: perhaps you never cycle level. Still, I felt calm as I thought, God is there, even when things happen. Personally, I also think that believing is not something you do only in the church. Of course, you'll get important input, you hear things that you did not know, the Bible is explained and you are just a short break in the hectic week. "But believe it is much more. For me it's in little things: pray, your dealings with others, enjoy what God is trying to make clear to us, that you think about each other, that you love one another, that you are doing the right things. In cycling values I try to carry out every day." 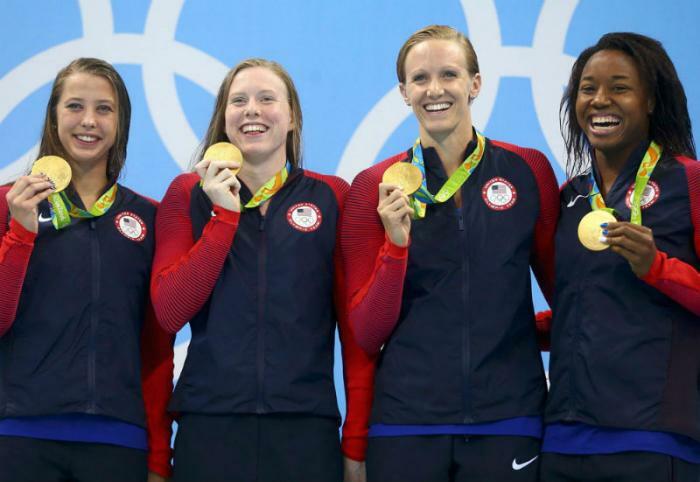 Katie Ledecky, a 15-year-old US swimmer, 16-year-old US gymnast Gabby Douglas, 29-year-old Jamaican sprinter Usain Bolt, 27-year-old US diver David Boudia, 19-year-old US gymnast Simone Biles and 30-yera-old US runner Allyson Felix are all some form of Christian and proudly share their faith. "I came to know Jesus Christ as my personal Savior at a very young age," Felix stated in a Beyond Ultimate report. "Ever since then, I have continually been striving to grow in my relationship with God. I was nowhere close to the perfect child. I had my share of difficult times along with some disappointing choices that I made, but thankfully God never stops loving me. "I'm currently a work in progress and like anyone else I face struggles every day. My goal is to be more Christ-like each and every day and that is not an easy tak. I know that I'm trying to be something different from [other Olympic runners] and after I run I hope that people can distinguish [Christ-like] character in the way I present myself." Other Christian Olympians include 27-year-old US basketball player Kevin Durant, 37-year-old US golfer Bubba Watson, 33-year-old New Zealand runner Nick Willis, 31-year-old former Jamaican runner Sanya Richards and 36-year-old British rower Debbie Flood. Several other Olympians are Christians who proudly proclaim God is the reason behind their success. Thank you, Lord, for blessing people with the drive and physical abilities to perform with other top athletes around the world. Bring them peace, safety and blessings. Amen.